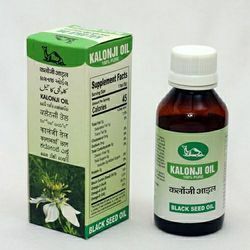 Providing you the best range of kalonji seeds oil and kalonji seeds with effective & timely delivery. We are offering Kalonji Seeds Oil to our clients.It has been traditionally used to treat a variety of ailments and conditions related to respiratory health, stomach and intestinal complaints, kidney and liver function, circulatory and immune system support and to improve health in general. Kalonji seeds are the small black granules found in the fruits of Nigella sativa plant which is an annual herbaceous plant which belongs to the Ranunculaceae family. This is a native plant of south-west Asia that is abundantly cultivated in India, Bangladesh, Turkey and other Eastern countries. The plant has erect stem, light green finely divided leaves, blue and white star shaped flowers and fruits bearing black seeds. These are usually triangular, tiny and hairy seeds of no more than 3mm in length and possess a severe pungent smell. The chemical composition of black seed is very rich and diverse. Aside from its primary ingredient, crystalline nigellone, this Nigella Sativa Seed contains 15 amino acids, proteins, carbohydrates, essential fatty acids, 1.5% volatile oils, 37.5% non-volatile oils, alkaloids, saponin, crude fibre and other minerals. However, all the components of Black Seed haven’t been identified until now. But research is going on around the world. The Kalonji seeds mainly constitute of alanine, arginine, ascorbic-acid, asparagine, campesterol, carvone, cymene, cystine, dehydroascorbic-acid, eicosadienoic-acid, glucose, glutamic acid, glycine, iron, isoleucine, leucine,linolenic-acid, lipase, lysine, methionine, myristic-acid, niggling, nigellone, oleic-acid, palmitic-acid, phenylalanine, phytosterols, potassium, beta-sitosterol, alpha-spinasterol, stearic-acid, stigmasterol, tannin, threonine, thymohydroquinone, thymoquinone, tryptophan, tyrosine, limonene and linoleic-acid. 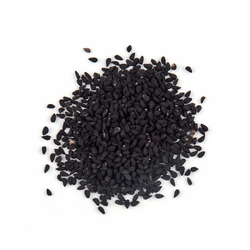 Kalonji Seed or Black Seed contains more than a hundred valuable nutrients. It contains about 21% Protein, 38% carbohydrates and 35% plant fats and oils. The contents are similar to evening primrose oil, but because of its complex composition, it is much stronger. The active ingredients of black seed are Thymoquinone, Nigellone and Fixed Oils. It also contains in significant proportions proteins, carbohydrates, and essential fatty acids. Other ingredients include Linoleic acid, Oleic acid, Calcium, Potassium, Iron, Zinc, Magnesium, Selenium, Vitamin A, Vitamin B, Vitamin B2, Niacin and Vitamin C.
Kalonji/Black seeds are rich in nutritional values. Black Seed contains Monosaccharides in the form of glucose, rhamnose, xylose, and arabinose. A non-starch polysaccharide component which is a useful source of dietary fibre is found in the black seed. Fifteen amino acids make up the protein content of the black seed. It is rich in unsaturated and essential fatty acids which cannot be manufactured by the body alone. They contain carotene, which is converted by the liver into vitamin A, the vitamin known for its anti-cancer activity. As these possess minerals like calcium, iron, sodium and potassium, they have anti-bacterial properties, anti-tumour principles, show anti-histamine activity and help to promote lactation.